Centered in Israel, Aroma Espresso Bar is a coffee chain with over 140 locations around the world. Besides coffee, Aroma serves Mediterranean-style sandwiches and salads. Although Aroma in the United States is currently only in New York, New Jersey, Maryland, and Florida, the coffee chain plans to bring its espresso to other states in the near future. 1. IN 1994, TWO BROTHERS OPENED AROMA ESPRESSO BAR IN DOWNTOWN JERUSALEM. Yariv and Sahar Sheffa founded Aroma Espresso Bar, Israel’s first espresso bar, in 1994. The two brothers borrowed $16,000 from their mom and opened their bar on Hillel Street, offering customers high quality coffee and made-to-order sandwiches and pastries. The bar became incredibly popular, as customers liked the fast service, reasonable prices, and high quality coffee and food. Aroma is now one of Israel’s biggest coffee chains, with more than 100 locations throughout Israel. 3. …AND THEN QUICKLY EXPANDED AROUND THE WORLD. 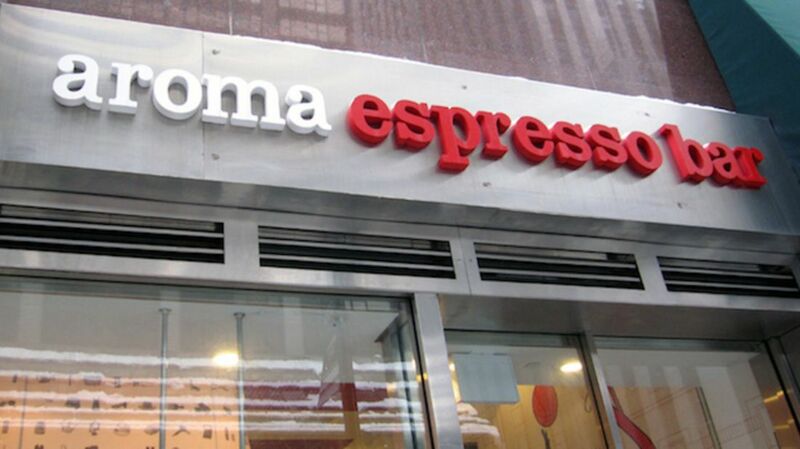 In 2006, the first Aroma Espresso Bar opened in the United States, in New York City’s Soho neighborhood. The next year, Aroma opened its first bars in Canada and Ukraine. In the U.S., Aroma is currently just on the east coast (in New York, New Jersey, Maryland, and Florida), with more locations planned to open in the Northeast in the next five to 10 years. 4. AROMA'S COFFEE BEANS COME FROM NAPLES, ITALY. Quality coffee is the biggest priority for Aroma, and they sought out a partnership with the generations-old Balestra family in Naples, Italy, whose prestige lies in their gourmet coffee roasting, to help make their equipment and process. Employees roast the beans in Aroma’s roasting facility, which opened in Israel’s Valley of Elah in 2004. Then, they ship packages of the roasted beans to Aroma locations around the world, meaning that Aroma customers in Miami drink the same coffee as customers in Jerusalem. 5. ALL OF AROMA'S DRINKS COME WITH A SWEET BONUS. Whether you order an espresso, cappuccino, latte, or tea, you’ll get a small piece of milk chocolate with your drink. If you want even more chocolate, the Aroma hot chocolate has milk chocolate pralines with a dusting of cocoa powder on top (marshmallows are optional). To differentiate itself from other coffee chains, Aroma focuses on serving foods at the peak of freshness. Daily deliveries of produce ensure that the vegetables in the salads and sandwiches are not wilted, and employees bake the pastries and bread each morning and throughout the day, seven days a week. No rock hard croissants or stale muffins here. 7. … AS WELL AS ON HEALTHY, WHOLESOME MEDITERRANEAN DISHES. Along with more standard fare like grilled chicken sandwiches, Caesar salads, and tuna salad croissants, Aroma serves Mediterranean dishes like Halumi sandwiches (grilled cheese with roasted eggplant, tahini, and pickles), Burekas (pastries filled with egg, feta cheese, tomatoes, tahini, and pickles), and Shakshuka (a breakfast dish with eggs in a tomato sauce). Aroma’s Bakery churns out bread and pastries made with whole wheat and zero preservatives or artificial colors. 8. THE AMBIANCE AND DESIGN ARE MORE SLEEK AND MODERN THAN COZY COFFEEHOUSE. Aroma sets itself apart from other coffee chains not just with its coffee and food, but also with its ambiance. Instead of aiming for a cozy coffeehouse vibe, Aroma hopes its bars invoke a sleek, modern, energetic feel. At Westfield Montgomery Mall in Bethesda, Maryland, the Aroma Espresso Bar seats almost 70 people and features stainless steel, bright red chairs, menus on LCD screens, and free Wi-Fi codes on each receipt. 9. A PALESTINIAN ADVOCACY GROUP PROTESTED AROMA WITH A LADY GAGA PARODY. A Palestinian group argued that people should boycott Aroma Espresso Bar because the coffee chain has a location in Ma'ale Adumim, an Israeli settlement in the West Bank, and they argued that Aroma should not be in business there because Israeli settlements in that region are illegal. Singing to the tune of Lady Gaga’s hit “Bad Romance,” the protesters sang “Boycott, boycott, human rights are hot” as they did some Gaga-inspired dance moves in front of Aromas in Toronto, New York, and eventually in Ma'ale Adumim itself. 10. AROMA ENCOURAGES PEOPLE WITH DISABILITIES TO SEEK EMPLOYMENT. Back in 1996, the first Aroma Espresso Bar in Jerusalem employed some workers with learning and physical disabilities. Aroma now employs special needs workers at almost all of its locations in Israel as part of the company’s commitment to social responsibility. Aroma locations in Canada also partner with a rehabilitation organization to give jobs to people with disabilities or injuries.